The dry seed piece of Gastrodia elata BL. of family Orchidaceae. Dug in winter or spring, dug in winter called Dong Ma with good quality, dug in spring called Chun Ma with poor quality. Solid, one extreme with withered buds with brownish red colour commonly called Ying Ge Zhui, another extreme with remained round umbiliform scar ablated from mother, natural transverse striation on the surface, yellow white color, bright cross-section and no hole in the middle. Dug, removed the stem and fibrous root, washed, low temperature dried; thoroughly moistened first then sliced, unprocessed. Extinguish wind and stop spasm, pacify liver yang, dispel wind and unblock collateral. Being sweet, moist and mild and with good mild action of extinguishing wind and stopping spasm, it can be combined with herbs to treat stirring of liver wind, fright epilepsy and convulsions caused by kinds of reasons with heat or cold, deficiency or excess syndrome. For acute infantile convulsions, it is often combined with liver-clearing, wind-extinguishing and spasm-stopping herbs. For instance, it is combined with Ling Yang Jiao, Gou Teng and Quan Xie, etc. 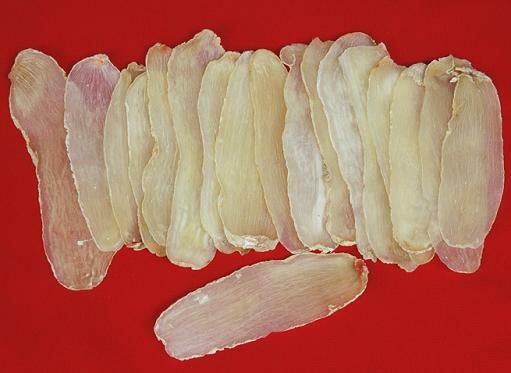 For chronic infantile convulsions due to spleen deficiency, it is combined with spleen-stomach-tonifying herbs and wind-extinguishing and spasm-stopping herbs, such as Ren Shen, Bai Zhu and Jiang Can, etc. For epileptic attack due to wind-phlegm obstruction, it is combined with herbs to resolve phlegm, extinguish wind to induce resuscitation, such as Dan Nan Xing, Quan Xie and Shi Chang Pu, etc. It is the key herb to treat dizziness and headache because it can extinguish liver wind and pacify liver yang. It is combined with herbs to treat kinds of dizziness and headache. For dizziness and headache due to hyperactivity of liver yang, it is often combined with heat-clearing and liver-pacifying herbs. For instance, it is combined with Gou Teng, Shi Jue Ming and Huang Qin in Tian Ma Gou Teng Yin. In addition, for dizziness and headache due to up-disturbance of wind-phlegm, it is often combined with spleen-invigorating, damp-drying and phlegm-resolving herbs. For instance, it is combined with Ban Xia, Bai Zhu and Fu Ling in Ban Xia Bai Zhu Tian Ma Tang. For migraine, it is often combined with herbs to extinguish wind, stop spasm, dispel wind and alleviate pain. For instance, it is often combined with Chuan Xiong in Chuan Xiong Wan. It can dispel exogenous wind and unblock collateral. For wind attack on meridians with symptoms such as paralysis and numbness of limbs, it is often combined with qi-nourishing and blood-nourishing and blood-activating and collateral-unblocking herbs. For instance, it is combined with Huang Qi, Dang Gui and Chuan Xiong and so on. For wind-damp arthralgia with symptoms such as pain and limited flexing and extending of joints, it is often combined with wind-damp-dispelling herbs. For instance, it is combined with Qin Jiao, Qiang Huo and Sang Zhi and so on. Decoct 3~10 g. Take powder 1~1.5 g.